Superior tonewood has a low density and high Young‘s modulus of elasticity, say EMPA resarchers into whether the acoustic properties of Norway spruce and sycamore wood can be improved with a controlled degradation process. The wood craft, finishing and lacquers used on the imitable 18th Century Stradivarius violins were long thought to be the key to their unrivaled sound. Work on "tone wood" by researchers at the EMPA Swiss Federal Laboratories for Materials Science and Technology support another theory: the wood itself was milled from trees that had suffered through a sustain period of drought. 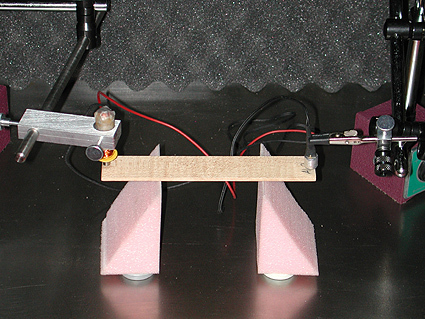 As a result, the wood is less dense, and yields instruments that are more resonant. The quality of wood for the manufacture of music instruments (tone wood) is determined by its physical properties. Wood with a low density, high velocity of sound and modulus of elasticity has superior properties i.e. its resonance characteristics and sound radiation is improved. While the subject is intriguing for luthiers of all stripes - guitars makers will find it interesting - it also has implications for controlling wood rot in a natural manner. The project springs from a Swiss national effort launched in 2008 to find new sustainable uses of the Swiss forest as a raw materials source, in a research initiative called "Wood Fibre 2020."